Before Francesco handles artichokes, he rubs lemons all over his hands. “This is the way I learned to keep the artichokes from darkening,” he says. It is actually more effective than merely rubbing the artichokes with lemon after they have been cut. 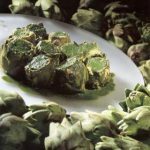 In this recipe the artichokes are baked until tender and served in richly verdant, garlicky herb sauce, a typically Venetian preparation. 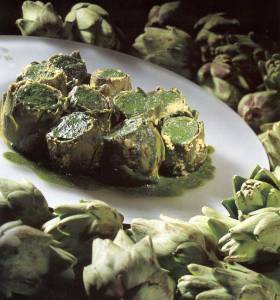 In Rome artichokes are fried, but in Venice the taste is for carciofi alla veneziana, baby artichokes stewed in olive oil. Cut the lemon in half, run the cut surface over your hands, then trim the artichokes. Juice the lemon and toss the artichokes in the lemon juice. Bring the water to a simmer, add the garlic cloves, and cook 3 minutes. Add the parsley and basil and cook 2 minutes longer, then drain, reserving the liquid. Mix the artichokes with the olive oil in a heavy casserole or shallow oven-proof saucepan. Add the garlic, parsley, basil, bread crumbs, and Parmesan cheese. Stir in 3/4 cup (180 ml) of the liquid reserved from blanching the herbs and garlic. Remove from the oven and separate the artichokes from the other ingredients. Set the artichokes aside. Remove and discard 3 of the garlic cloves, then puree the remaining herb mixture, adding another 1/2 cup (125 ml) reserved liquid. Pour the sauce over the artichokes and serve warm or at room temperature.